North Fork Correctional Facility is located in Sayre Oklahoma. It is a medium security prison that houses up to 2,400 male inmates. 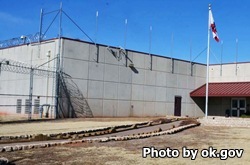 The facility is privately owned and operated by Corrections Corporation of America and runs under a contract with the Oklahoma Department of Corrections. North Fork Correctional Facility has education programs for inmates that include adult basic education and the ability for the inmate to obtain their GED. Additional programs provide substance abuse treatment and counseling. Offenders can also receive necessary medical, dental and mental health services during their incarceration. Visiting at North Fork Correctional Facility occurs on Fridays, Saturdays, and Sundays from 9am-4:30pm. Inmates are also allowed visits from 9am-4:30pm on holidays that include, New Year's Day, July 4th, Thanksgiving, and Christmas. Visitors are allowed to bring up to $20 in small bills, a small unopened package of tissues, and ten photographs.